Day 258: The Italian Job . . . The amazing trivia about this movie goes on and on – ok, we must admit it’s one of our favorites and a must watch any time we stumble upon it!! So, in honor of ‘The Italian Job’, we brought out an Italian job! 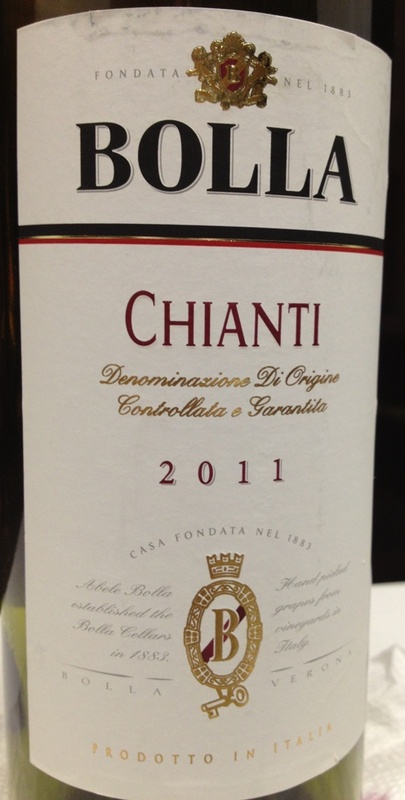 Yep, tonight we sampled and enjoyed a 2010 bottle of Bolla Chianti and at less than $10 a bottle, you’ll be amazed at the taste for the money. Yes, most Italian wines are better when left alone for a few years, but this one is ready to enjoy! With a ruby to deep garnet red color, and with intense aromas of violets and red cherry, Bolla Chianti is medium bodied wine with lively fruit flavors. We liked that it was full of flavor but it was also easily accessible. The nose won’t make you happy. . .it’s rather bland, but noticeable nonetheless. The taste of this wine was fruity, complete, in the style of true Italian and delicious! At the end of the day, this is a wine worthy of inclusion at your house. With a great taste, youthful body and superb aftertaste, you’ll be amazed at the quality of the wine and how many people would like to be a part of the wine!!! Whether its ‘Ocean’s Eleven or the Italian Job’, we know that movies like this help us to escape reality. . . and. . .sample better wines. Categories: Uncategorized | Tags: Bolla Chianti, Charlize Theron, Donald Sutherland, Edward Norton, Mark Wahlberg, Ocean's Eleven, Seth Green, The italian Job | Permalink.